In vino veritas, but in Qt we trust. For many years, TeamViewer for Linux was based on Wine. The growing user base and demand as well as technical limitations of that approach lead to the decision to start over with a native, Qt-based user interface. The development has been going on for a while now, starting with the Host for Raspberry Pi in 2016 and adding the Host for PC earlier this year. TeamViewer and TeamViewer Host now share most of their code and integrate more seamless into modern desktop environments than ever before, and we will continue to improve the user experience in future updates. The TeamViewer preview includes all the features that were already present in the TeamViewer Host: Incoming remote control, incoming file transfer, account assignment as well as DEB and RPM repositories. Additionally this first release includes the Computers & Contacts list - allowing quick access to your servers, colleagues and friends - and, of course, outgoing remote control. The StatusNotifier (tray icon) toggles the Computers & Contacts list on mouse middle-click if the desktop supports it (KDE Plasma: yes, Gnome: no). Obviously, some features are still missing, but we plan to add them soon. You can expect frequent updates via the repository. We are interested to hear from you which ones you think should have priority. Please take the survey. Sign In with Xorg instead of WaylandOn Wayland, currently only outgoing remote control and incoming file transfer are supported. If you need incoming remote control, you have to sign in with classic Xorg. From a developer perspective, we would be more than happy to leave the archaic X11 technology stack behind and jump on the new and shiny Wayland train. However, that is not as simple as it may seem. By design, Wayland does not provide an interface to do remote control (screen capturing, mouse and keyboard emulation). This is to keep the Wayland core lean. The idea is that the compositor provides these interfaces, which could mean that TeamViewer would have to implement different interfaces for every desktop environment we want to support. This is unfortunate, but it's even more unsatisfying that these interfaces are not available yet. The closest to having something useful is Gnome, so it is likely that it will be the first desktop where we can support Wayland. To summarize: Yes, we want Wayland support, just as much as you, and we will work on it. I just wanted to let you know that it's a bit more complicated than 'just make it happen', as it is for the other features. If you are interested in RedHat and CentOS, please also have a look here. If you are using Gnome and TeamViewer does not appear in the notification area (or tray), you might want to install KStatusNotifierItem/AppIndicator Support plugin. Ubuntu has that extension by default. Any chance for a armhf / Raspberry build of the client? Give thumbs up if you like it! Connecting to a windows machine from linux does not show toolbar. Thought it was a manjaro/i3 thing, but tried with unbuntu 17.10. Does anyone have a top-toolbar? Without one, I can't 'press' ctrl+alt+del to log in to my windows machine. Where can we submit bugs? 5. All computers on list are showing as online. No toolbar for me too. Using XUbuntu 17.04 64 bit and connecting to another Linux machine with XUbuntu 16.04 LTS 64 bit. Guys, please read the post carefully and take the survey. It's all in there. It's not bugs, it's just not done yet. Results of the survey will influence the development roadmap. The remote control toolbar will probably return very soon, and you'll get the update notification with your system updates, via the teamviewer repository. Really want to try it out, but I cannot install it in Jessie because it depends on Qt libraries >5.5 while latest version in repos is 5.3.2-4. The host works because it depends on Qt >5.2. Will the final version of the client require Qt 5.5? @DanielStm Thanks for your work on this version! is there any way to send CTRL+ALT+DELETE wihtout the toolbar? I couldnt see it. Is the repository auto configured on ubuntu when i installed the preview? @DanielStm, i'm understand all of the post and i give you my feedback only. (also with survey). You also try to understand us, because without this options version x13 is useless. So if any of our client will update host to version 13 we'll not be able to give them support from linux stations. Of course you did great job with new version without wine but until linux version will not be ready you shoutld't announced new windows version as final. (IMHO). First, thanks for the good work. This is a step in the right direction, and I am vary pleased to see you do this us linux-users. Even though I wasn’t prepared for the first release to be so much of a "work in progress", I can accept that for a foreseeable future, since I have high hopes this will be so much better than the old wine-implementation. The native TV-app is very snappy and fast, I like what I see. BUT, until we have a way to send CTRL-ALT-DEL (via bar or other workaround), it’s almost useless for me. 80% of the clients I connect to are windows servers. I'm running here an uptodate arch linux with gnome. I downloaded the current version of Teamviewer 13 from here and ran the included binary. Teamviewer starts up, but it says I've got no internet connection. I can't activate my license and via "Computer & Kontakte" in the right corner I can't log into my account. Needless to say: My internet connections works fine. - We will most likely really depend on 5.5 features in 2018, maybe spring, maybe fall. As we don't want to bump dependencies within a major release, we did that now. Your welcome! We enjoy that very much ourselves. Developing with Qt is 90% awesome. We hear your feedback, and we are seriously thinking about timely update for toolbar/Ctrl-Alt-Del. Restore the default with: sudo teamviewer repo default - see explanation with teamviewer help. Never saw missing texts in the menu. I just tried to reproduce it with my colleague, with Ubuntu+XFCE and Xubuntu 16.04.3. From the style it looks like you actually have Xubuntu? (Yes, there actually seem to be differences). Anyway, we couldn't reproduce it on both. Can you try to play around, maybe restart (system and/or Gui, close via tray icon), change resolution, DPI, (TeamViewer) language? Also, what is your system language? Please PM me with the results. Hi @Chrissss, thanks for your feedback! I can confirm that as a bug in the non-installed tar package. Which means, it's currently only functional when installed. Please understand that other things might have priority, but we'll look into it. Arch Linux: As you know we don't officially support it, but I assume they will soon pick up TeamViewer 13 and create packages. When i try to connect to computers to my list/contacts I get request for password but there should be no request! 2017/12/04 15:46:39.132 12762 xxxxxxxxxxxxxxx S! RemoteSession::AddRequestedCarrier(): request carrier UdpToPartner failed! I use Ubuntu 16.04 and I am frustrated. The toolbar do not appear and I cannot login on my Windows hosts because I cannot do a CRTL + ALT + DEL. The problem is that I am not a BETA user, to test it. I need a final version working. I have aquire it it for working purpose, not to be a BETA tester. Do you have the solution? All Ive tried not worked. The new release runs fast and smoothly on Debian Testing + KDE. I agree with others, though, that the ability to send Ctrl+Alt+Del should be top priority on the missing feature list. Hope we'll get the old toolbar back soon, as I need to switch between different monitors of the remote system, too. Anyway, I'm very pleased to see that Teamviewer does not forget about the Linux users! Thanks for that! we sincerely apologize for the inconvenience caused by missing Ctrl+Alt+Del.. I have to admit we completely underestimated the demand for this little detail, just as much as we overestimated the demand for Wayland. That's why we do this community thing and specifically ask you in the survey which features matter most to you. We have already decided to do an extraordinary, intermediate update soon, bringing Ctrl+Alt+Del back. A few other details might also see minor improvement. We are really commited to straighten this out. My word on it. P.S. : @Dusan, I'm not certain what you mean by how to downgrade, but you can always get older versions here. If that doesn't answer you question, I'd recommend to call our support hotline or PM me. Again, sorry for the rough transition. Thanks for all the great work so glad to see it on native Linux! I'm using Xubuntu 16.04 64bit with lots of tweaks. I don't see any text problems, no connection problems, logged right in and logged right on. Couldn't do anything no Ctrl+Alt+Del or file upload LOL went back the VM. Not disappointed I upgraded my license at all! I will be waiting happily for the next update! The update look promising. Resizing seems much less buggy. Also the "Del" key works (after so many years). Haven't tried the numbers on Mac machines (which were a PITA) yet. Right click in the contacts list to send an "invitation" to my clients so they only have to click "accept" rather than spelling passwords (difficult for some non-english users). Also ability to edit a computer's properties or to add a new one. Haven't tested that horrible behaviour in TV12 where it would "steal" the sound/microphone and make skype+TV sessions impossible (sound too low or continuous echo/larsen). Thanks for working on a native solution for us Linux users and keep up the good work. It does not work with dark themes already. As you can see, there is some text "missing". But it's not missing, I guess it just has a hardcoded color. Hey @Bleuzen, thanks for the pointer! This should be an easy fix. Working good for me on Kubuntu 17.10 only gripe is no toolbar to do things like file transfer. I actually prefer the new Qt interface a lot and not having buttons everywhere near the main interface, but I would prefer some way to show a toolbar when I do need to transfer files. The name of the connected host in the window title: If you have several parallel sessions open and only see "TeamViewer <3>", "TeamViewer <4>", "TeamViewer <5>" in the title you absolutley lost in space. "where I am?" I hope the other points gets serious attention too because TV13 currently is really unuseable for me on Linux. @mfernauThe window title should be the simplest, can be done very soon. Searchable C&C I expect for Q1 2018. Filetransfer: possible for Q1, but don't pin me down to that. It looks that TV13 for linux will be usable not faster than february or march 2018. Maybe better idea will be to give users TV13 in old way with wine until new version will not be compleltly ready? Maybe using wine is not so good like qt but it works for now (with the most importent tools we need). @GoSane, I can not reproduce that. Can you add some details on which systems are involved here? Sure : Linux controlling MacOS computers. Happenned every time. Controlling Windows seems to work correctly. Tell me if you need more info (and which info). Well, I stated earlier that 80% of my connections was to windows servers, why ctrl+alt+del was so important (glad to hear you are working hard on releasing a fix for this). The other 20% of my connections are to QuickSupport clients, who runs the QS-client from my homepage. But the active QS-sessions don't show up in the C&C-list on the linux version. PS: I don't know if it's expected behaviour, but just FYI, if a client, who is present in my C&C list normally, closes the full version of TW, and starts a QS. I am able to connect to them (but from their normal saved C&C-instance. @DanielStm thank you for your reply. Would be good to have this done - until then I need to stay on TV12. Recording a session to disk is also an important thing, but at least not a blocker for me. I just discovered an anyoing bug: The window size is oftern shrunk down to a strange size. My resolution is high enough to display many sessions in the natural resolution (2560x1080). But often it happens that TV starts with a smaller window and thus with a shrunk resolution. As there is no easy way to "restore" the session to its natural resolution I often end up in a session with streched or shrunk displays and thus have fuzzy fonts. To have TV13 as a wine version until the native one is useable would not only be nice to have - In my eye its a indispensable thing because we're paying customers who need to work with TV all the day and really need a working and useable tool! Are there any plans to release a .deb and/or tar.xz versions of the teamviewer-host? Hello, TeamViewer team! Thanks for the amazing work. I tried TeamViewer 13 today and found that, without the meeting function, it's useless to me any my start-up for now. We were using it because it was the only app I knew of that could share one screen in a multi-screen setup. 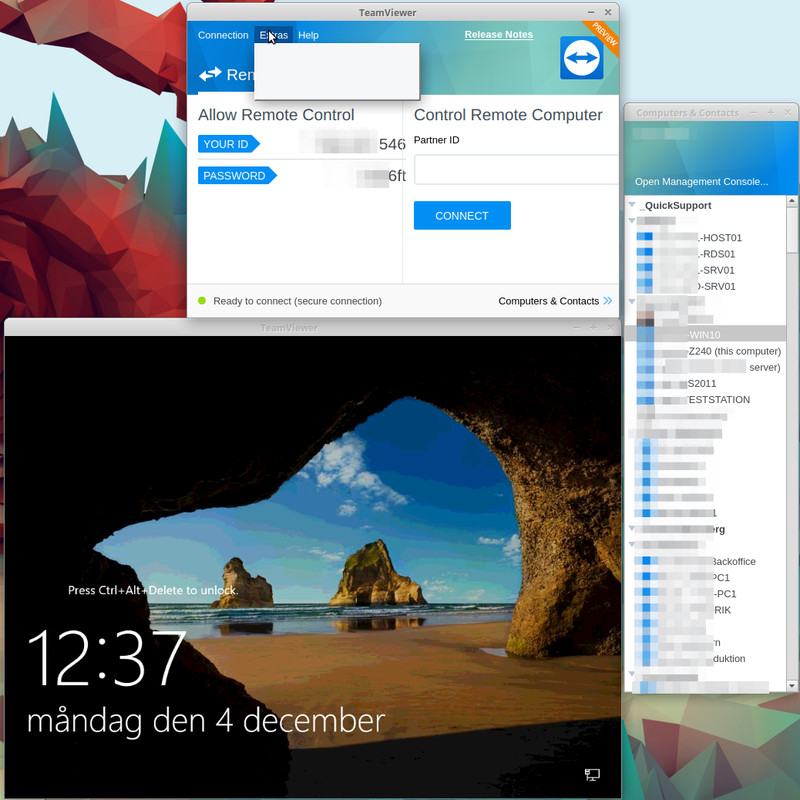 (All the others, like Skype or Hangouts, can either share all screens at the same time, or only select open windows). I really hope the meeting function comes back soon, because until it does, operations in our company are impacted. We're looking to find workarounds in the meantime (we'll probably run the Windows version in a VM or I'll have to turn off my second screen and use Skype). 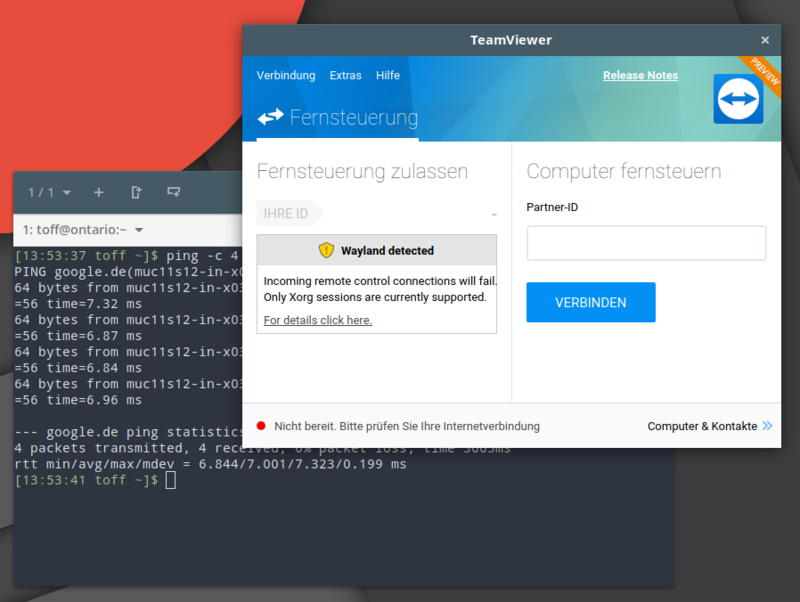 The state of TeamViewer 13 for Linux is extremely disappointing. It lacks all but the most basic features, and it seems unlikely that is will reach parity with the Windows version (or even Teamviewer 12 for Linux) any time soon. I appreciate the work the Linux team is doing to get us a native version, but the fact that it was released missing vital functionality is bizarre, and not in line with the usual high quality products that TeamViewer releases. @DanielStm I'm using a dark theme, Greybird, I think it is one of the built in themes with Xubuntu. On my workstation the menues are blank (no text). But dont seem to be theme-related. btw, are the changelog published somewhare? I apologize for the inconvenience caused by this. We will publish an update before Christmas and include the mostly missed features such as Ctrl-Alt-Del, switch screen and easy access. But currently lag a bit behind. However, I write these community articles to give you much more information than is typically included in changelogs. I'll continue to do so and be as transparent about our plans as I can. thank you very much for the update. I really do look forward to put the Linux TV13 to work. Although it has been said here before I'd like too express that I greatly appreciate the work of the Teamviewer Linux team, and I think, the native version with Qt is a much better approach than wine was. I'm sure, it is the way to go. I also like the way you (the developers) communicate with us (the customers) directly. Thank you for your prompt replies! However, I also have to agree with @SamH_SUQLD and I'm lacking a better expression. I also think the current state is kind of bizarre. As brought up by someone else earlier, the TV13 upgrade was forced on me, because some Windows client decided to do the upgrade on its own. I then did the upgrade, only to realize, that our license was only good for Version 12. $800 later, with an upgraded license (I thought it might cure my issues), I'm stuck with the native 13 version. I understand it's still a preview and for a 'beta' it works pretty good. It connects to all my clients but then I can't send CTRL-ALT-DEL to a windows box because you forgot to add a button for it?! Same thing with the screen switch function... It is bizarre! What really annoys me, as a paying customer with a subscription is the bombardment of new feature announcements for TV13 during the last months. And I always thought 'iOS screen sharing', 'asset management', 'service case handling', etc, etc. - I don't need those features! I don't need TV13! Now I have it. Now I've paid for it, and now I can't send CTRL-ALT-DEL? How could you miss that?! Sorry for the long story but I had to get this of my chest. After upgrading, downgrading, upgrading again, I'm now stuck with a Windows laptop for remote support. And I really hate it. Is there a way for us to get a notification, when a working version is released? I totally agree with Ballisto and he just repeated what I already directly told the customer support via mail. I think TV needs to deploy a wine TV13 version in the meanwhile like the vesions before. Regardless if this means double development or not. If you want to redesign TV13 from scratch - which we're all really appreciate - It can't be that your customers need to pay for this and needs to be happy with a TV-Feature-Version like what.. Version 1? I really NEED those basic features like filetrandfer etc and to be reliant on a windows VM/Computer isn't very satisfying.. I am more than just a little irritated! This is costing me time and as we all know "TIME=MONEY"
I understand that you desire to move to a native version, but leaving us hanging like this STUPID! Previous versions worked well enough, can we at least get some like that for v13 until you decide to fix this garbage you through out on us! or you could provide us with a button in TV13 to roll back to 12 until this is fixed! We need a REAL solution and we need it now!